On the 17th of November 2012 at approximately 10:50 pm, a 16 year old male and 2 of his friends were walking east on Hunter Street East at Rogers Street. As they were about to cross the street 4 youths in their late teens were walking south on Rogers Street and started to call the victims names and challenge them to fight. The victims ignored the 4 males, but 2 of the males proceeded to engage the victims resulting in one of them being pushed and the 16 year old male being stabbed in the lower back. The 4 teens then ran back northbound on Rogers Street. The victim’s friends rushed the victim to hospital and called police. The victim was then transported to Sunnybrook Hospital in Toronto for further examination and potential surgery. Although serious, the injury is not life threatening. The only description for the 4 suspects is that they were in their late teens, possibly high school students, wearing dark clothing and straight peak ball caps. This was an unprovoked incident and the suspects are not known to the victims. 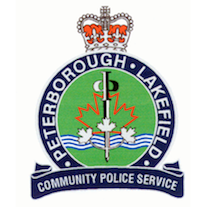 Anyone with information is asked to contact Peterborough Lakefield Community Police at 705-876-1122, or Crime Stoppers at 1-800-222-TIPS or Stopcrimehere.ca.